Most of us take tires for granted. If we don’t get our oil changed regularly or perform other types of maintenance on our vehicles, they’ll perform poorly and could have issues as a result. With tires, you can certainly feel a difference in performance if you know what to look for, but many drivers don’t even realize their tires are an issue until it’s too late. This can lead to a host of issues, including flat tires, accidents, and other damage to your vehicle. But how do you know when it’s time for new tires, and what are some other important things you should know about tires? Let’s find out! The easiest, and most used, way for regular folks to check tire tread levels is to use the penny test. Take a penny and place it between the grooves of your tires with Lincoln’s side facing you with his head down. After placing the penny in between the grooves, check to see if the top of Lincoln’s head is being covered by the tread. If you can still see the top of his head, your tires are really worn and should be replaced as soon as possible. But if you can’t see the top of Lincoln’s head, this more than likely means you have more than the recommended level of tread remaining. Feel free to stop by DePaula’s service department if you’re unsure your tires have more than the recommended tread left. We’ll let you know our expert opinion, and can even help you shop for new tires if it turns out you’re in need. There are so many different types of tires Albany stores have available, from so many different brands, that the buying process can be overwhelming. For regular vehicles, however, the best way to choose tires is based on what’s specifically recommended for your vehicle and the type of driving conditions you’ll be facing. 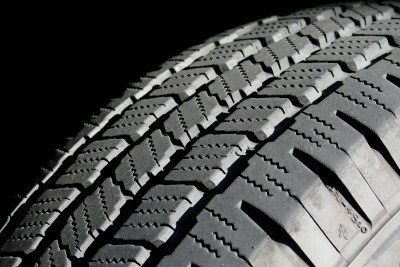 All-Season tires are made for to be used all-year round in all types of different climates. These tires can handle dry and wet conditions to provide drivers with consistent handling regardless of the weather outside. Winter tires (a.k.a. snow tires) have tread that’s designed to gain traction by crunching through snow and ice that plagues roads in many parts of the country during winter. The rubber winter tires are made from differs from other types of tires, as it doesn’t get hard the same way regular tires do in colder weather. 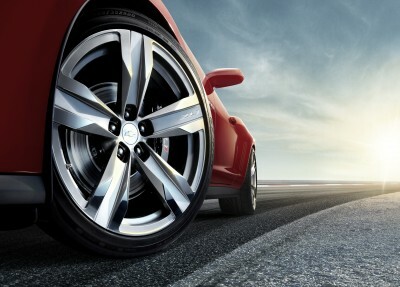 Summer tires are primarily made to perform best in dry weather, but can also maintain traction in wet weather as well. They are not recommended for multi-season use. Since all-season tires became an industry standard, and most frequently found in tires stores in Albany, NY, summer tires have become less and less used, except by performance car owners. Your tires need to be checked out the same as any moving part in your car does to ensure they’re performing at their absolute best. Many new cars include tire pressure monitoring systems that let you know when one or more tires has less than the recommended level of air pressure. This makes it easy to know when your car needs air so that you’re evenly distributing the work to all four tires, maximizing their overall performance. If your vehicle does not feature a tire pressure monitoring system, you can find reliable digital air pressure and inflation systems at the store, or use a simple gauge and use an air pump at a gas station to ensure your tires are at their proper levels. Like many types of regular maintenance, experts and car manufacturers recommend that you get your tires rotated at different times. Some say every 5,000 to 8,000 miles, which is about once per oil change, while others say once or twice a year. To be safe, you can have your service technician rotate your tires conveniently while you’re in for an oil change, but be sure to check your owner’s manual for specific instructions from your vehicle’s manufacturer. You can also always ask a DePaula technician to check your tire pressure levels during your next service appointment, as we’re always happy to ensure your vehicle leaves our shop performing better than before! By now, you’re probably thinking that tires shouldn’t be this complicated, right? But really, they should. They’re what keeps your vehicle on its projected path, ensuring you have the traction and balance to drive in all manner of road conditions. 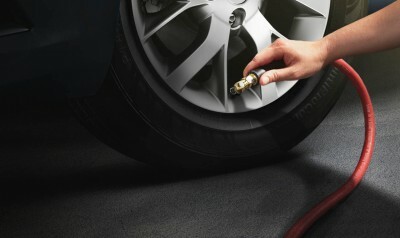 Beyond ensuring proper air pressure and regular rotations, though, what more is there to maintaining tires for the long haul? Only a few more things, but they’re just as important, so read on! A car that’s out of alignment will often feel like it’s trying to pull you one way or another when driving in a straight line. This is a suspension issue, and can happen anytime, from something as simple as hitting a pothole to a minor accident. This can affect the overall performance of your car, including uneven tread wear on your tires. If you feel like your car is out of alignment, bring it to DePaula Chevrolet service center and we’ll get it checked out. Another issue that might seem out there for many is wheel balance. An out of balance wheel can add more or less load to the rest, and that can cause an increase in tread wear and strange vibrations. It’s even known to put more stress on surrounding parts, leading those to wear out before their time as well. How you drive can often be just as important as how you maintain your tires, as bad driving habits can shed life (tread) off your tires. For instance, speeding generates more heat than casual driving, which not only affects tread wear but also increases the likelihood of a catastrophic tire failure. Driving safe is not only the right thing to do, it saves tire tread too! Whether you need advice, a convenient Albany tire shop, or expert tire service, bring your vehicle to DePaula’s service techs and rest easy knowing your car is in good hands!